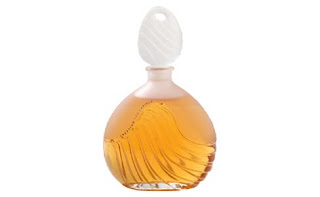 It seems like everything I've been writing about recently has been a chypre, but honestly, oakmoss was ubiquitous up until the late 1980s: if it wasn't in everything, it came pretty close. It also seems like everything I've been writing about recently has been accompanied by a comment along the lines of "They don't make them like these any more." And they don't. They can't: even if the ingredients hadn't fallen victim to IFRA regulations, the fragrances wouldn't sell well enough to make them a viable business proposition, because they belong to another time. They'd smell "old-fashioned" or "old-ladyish" to the modern (i.e. young) nose. Women over 40 might buy these interesting, complex fragrances, but such women are not the perfumery world's target market any more. Top Notes: Bergamot, Spearmint, Galbanum, Green Accord, Aldehyde, Pineapple, Marigold. Middle Notes: Muguet, Tuberose, Orris, Narcissus, Rose, Cyclamen, Orchid. Base Notes: Oakmoss, Amber, Sandalwood, Musk, Benzoin, Tonka, Cedarwood. As often as I like to say that a list of notes is usually pretty useless, here's the exception; that's a plausible description of Armani, which is as classically constructed as anything you can imagine. The middle is a big, no-kidding bouquet of flowers, lots of cyclamen but otherwise a huge abstract armload of flowers. Jammed down through it is a luminous spike of bitter greenery fizzing with aldehydes and a surprisingly clear spearmint note that manages to avoid toothpaste-ness. And underscoring the whole thing is of course an ungodly quantity of oakmoss, accompanied by a great dollop of sandalwood. The presence of amber, benzoin, and tonka could have steered the whole thing towards candy sweetness (and nowadays certainly would), but Armani was not interested in being sweet, or approachable, really, or even likeable. It was launched in the early 1980s, so, like so many strict chypres, it had only one thing on its mind: control. The flowers were a disguise. 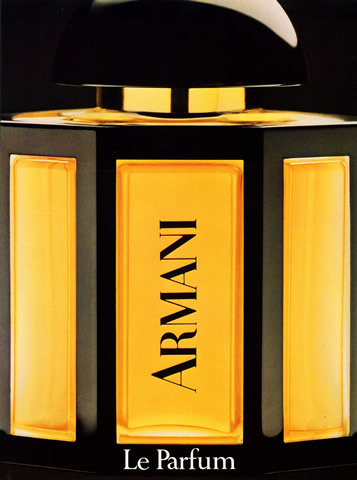 Armani was a perfume not to seduce, but to search and destroy. would wear sugared-bronze Shalimar (and did) when she meant business, but a woman like Katharine Parker would be wearing an intimidating floral chypre like 1988's Knowing, or 1984's Paloma Picasso Mon Parfum, or Armani, and she'd mean it, too. I'm working my through the batch of scents (minis and samples) that I borrowed from my mom on my last two visits, and as a consequence I'm talking about oakmoss yet again. But there's no way around it! They put it in practically everything in the fifties through the eighties. There was somehow a cultural consensus that oakmoss smelled terrific, that a perfume ought to have it, and as a result, many scents from that era smell richer, warmer, and fuller than most modern scents do. (Just putting synthetic sandalwood, vanilla, and amber in the base won't cut it.) For the last twenty years or so, and absolutely in the last decade, the emphasis in commercial perfumery has been on light, fresh, transparent: "watery" is often seen in the description of scents, as if that were somehow a good thing. A few niche houses reliably buck the trend: Ormonde Jayne and Serge Lutens, among others, have a number of lush, dense scents in their collections. 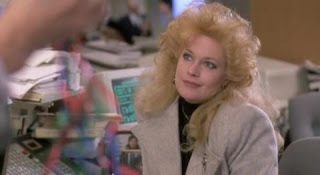 But pretty much everything you find in the drugstores and department stores these days is thin, simplistic, a bit wan. 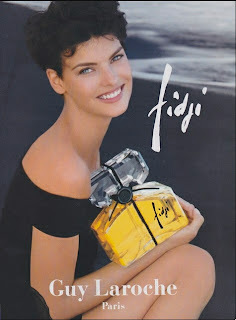 I expect the same is true of the modern version of Fidji, though I admit to not having smelled it in years. Some reviews I've read mention that the company claims Fidji has never been reformulated, which is laughable: others mention that it seems smaller than it used to — remade to suit modern tastes. The wee bottle of EDT that I have in my hands, though: oh, boy! Nowadays if you're going to do a tropical scent to suit the modern nose, there is really only one way to go: lots of wet transparent fruit (mango, coconut, papaya, guava), lots of thin bright tropical flowers (gardenia, frangipani, jasmine sambac), lots of vanilla in the base, more or less a drink you can wear. But Fidji manages to concoct a fantasy of a tropical island without dipping its toe into any of these pools. In what seems like a kind of magic trick, it manages to balance lightness and heaviness without ever tipping over in either direction. The (theoretical) list of ingredients: Galbanum, hyacinth, bergamot, lemon: Carnation, orris, jasmine, rose, ylang-ylang: Vetiver, musk, sandalwood, oakmoss. These lists are as ever a vague guideline and nothing more: they're undated, so this could be from any version of the scent, and they're invariably incomplete, listing things the company thinks you'd like to smell rather than the actual components, which would frighten most people away. Fidji opens with a radiance that can only be the combined efforts of a lot of high-quality synthetics: aldehydes for lift and brilliance, salicylates for breadth and harmony, doubtless some others I've never even heard of. But the most striking thing about the opening is how sharply green it is, that dazzling galbanum bitter-greenness that isn't seen much these days. It's tropical without being wet or heavy, and it makes you long for the days when the elements of a widely available commercial scent could be interesting or thought-provoking rather than merely pretty. 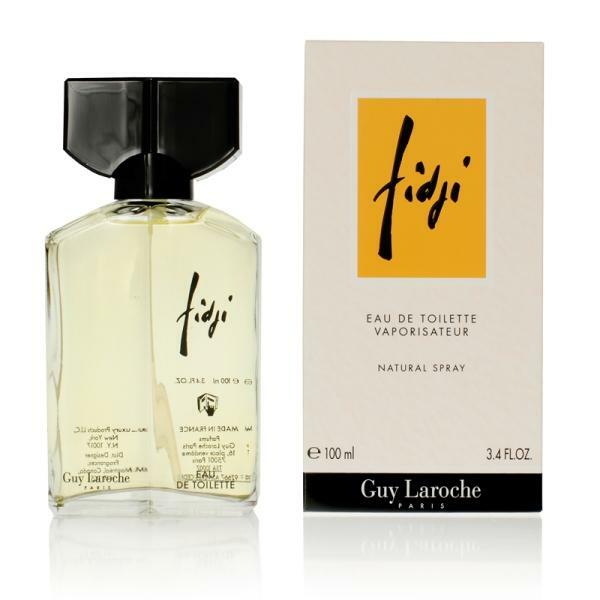 The middle and the base are almost one and the same: the base notes start appearing early on, beginning with the oakmoss that, although Fidji is not a chypre, adds fullness and earthiness to the rich floral bouquet, which includes tropical ylang-ylang but otherwise eschews the expected heady white floral in favour of something fresher, mostly spicy carnation garlanded with rose petals. There is a plenty of musk in the middle/base as well — not the cheap, tinned "white musk" that is the modern-day version of musk, but something warm and rich and animalic, poured in so lavishly that even I (who hardly ever notice the stuff) can smell its presence. Maybe whatever is currently being sold under the name of Fidji smells pretty good, but it can't smell this good: it couldn't possibly, because this sort of thing is no longer in fashion. If you have some of the vintage, wear it and treasure it, because they don't make them like this any more. 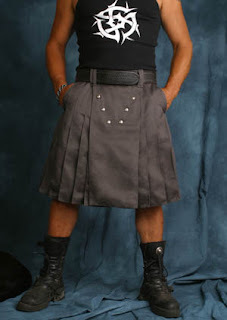 A chap walked into the store a couple of days ago wearing a Utilikilt, and I immediately felt kind of bad for him, because there was no question that he felt self-conscious about it. There is only one way for a man to wear a kilt, and that is confidently: if you look in the mirror and have even the slightest doubt about it, if you think people are going to be making fun of you behind your back as "the guy in the skirt", if you think you are going to be thinking about the kilt instead of whatever needs to be concentrated upon as you go about your day, then you need to take it off and put on some pants before you head out to face the world. The only way to wear a kilt is by not giving a good goddamn what anybody else thinks. This, as it turns out, is also the secret to the classic chypres. Florals smell soft and approachable, orientals lush and seductive, fougeres crisp and no-nonsense. They smell good. Appealing. A chypre is something else altogether, because the core of it, layered between fresh bergamot and warm labdanum, is oakmoss, which is fascinating, enigmatic, and earthy, but not immediately attractive. It's the gin-and-tonic of perfumery: you have to learn to like it. A chypre will be bolstered with many other things: there are floral chypres, oriental chypres, fougere and fruit and leather chypres, but always at the heart of it is that essential strangeness. And because it is strange, wearing it requires a certain amount of self-possession. 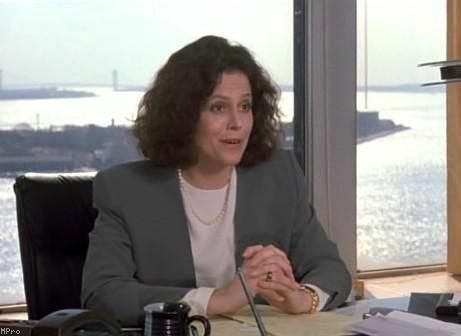 The message you are broadcasting is not "I am sexual" or "I am innocent", but "I am my own person," with a definite subtext: "and I don't really care what you think." Classic chypres smell like confidence. They bestow confidence upon the wearer. How is it that we let them slip away? I don't think Ted Lapidus ever had much of a presence in North America, although there were always one or two of his scents floating around in the eighties and early nineties in the department stores, at least in my part of the world: I remember seeing Création, Lapidus Pour Homme, and Fantasme at various times, and there may have been others that (somehow) slipped under my radar. Since Création was launched in 1984, just about the time I started paying serious attention to scents, it's no surprise that I discovered it (I was smelling everything I could get my hands on). Since it's a chypre, it's also no surprise that I loved it (even though I had no idea at the time what a chypre was). Création is one year younger than Ungaro's Diva, and definitely related to it, though not a copy: they're both expansive eighties-style chypres, though, and they both take up a lot of room — pretty much a trademark of the genre. Vintage Création starts out as a bushel-basket of fruit, peachy and sunshine-bright, with a dose of blackcurrant from the damascones that were becoming so widespread in the early eighties (and reached their zenith in Dior's Poison the next year). The middle is floral, but unlike Diva's oversized, vampy seductress flowers, Création's are fresh and summery, held in check only by the sizeable dose of oakmoss, which casts its usual crepuscular shadow over everything: it's possible to make a really high-spirited, cheerful chypre (just look at Yvresse), but the only way to do it is to play down the oakmoss. 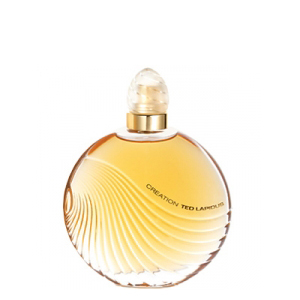 To my extreme surprise, Création is still being manufactured, in an exceedingly nice revamped bottle. As ever, I don't know what it smells like now, but it is an easy guess that the oakmoss is gone or seriously diminished, and if the scent bears even a trace of its former self, it's probably a patchouli floral like so many others. In truth, it was a chypre like so many others, back when it was new: but it was a really good one. On my way back from visiting my mom, I spent some time in Toronto with my friend Ralph. After we'd seen a movie, we popped into a drug store so I could look for some shower gel: the toiletries in my hotel room weren't really up to scratch, and I wanted to be able to shower without feeling the need to gag. No dice. Nothing was unscented, of course: hardly anything is any more. I must have opened and sniffed a dozen bottles, and I didn't like any of them, so I left empty-handed. Ralph mentioned that his wife was having the same problem: she could hardly find any usable personal-care products because she was becoming increasingly sensitive to the fragrances they all seem to contain. I had to tell him that the problem isn't necessarily with the fact of fragrance (it is possible to scent a product attractively and unobtrusively), but the nature of it. In the last couple of decades we seem to have reached a cultural consensus: every fragrance, every scented thing, must smell fresh. It isn't enough that laundry detergents, fabric softeners, and dish soaps must smell clean, bright, fresh and airy: so must fragrances, shampoos, conditioners, shower gels, sunscreens — every single thing we put on our bodies. I am scarcely exaggerating. It is essentially impossible to find a mainstream scent that doesn't start out with the ubiquitous fresh-ozonic top note. Once upon a time, you could walk into a department store and have your choice of a dozen different styles of scent with a hundred little variations to distinguish them one from another. Nowadays, everything has been reduced to a lowest common denominator, and that is the imaginary, reconstructed scent of freshly laundered clothing and thoroughly scrubbed skin: whatever fragrance category a scent falls in, be it a floral or an oriental or a "new chypre" (with patchouli subbing, inadequately, for oakmoss), it must smell clean — or rather cleansed, purified. For some reason, we seem to have voted to smell as if we didn't have a smell and never did. It's not just new scents, either. Long-established fragrances have also been reformulated wholesale to appeal to the modern nose with its endless desire for the illusion of perfect sanitation. The once-ravishing Trésor has been destroyed, to my everlasting dismay, by the addition of a needle-sharp fresh top note. Another fragrance that is gone is Jolie Madame de Balmain, though that one isn't just spoiled by the addition of a soap-clean top as Trésor is: it's a complete reformulation, an entirely different scent under the same name. My mother fell in love with Jolie Madame in the mid-1970s and had been wearing it ever since: I'd bought it for her a couple of times by mail order as it became harder and harder to find. The last time she bought it, she discovered that it had changed: she wears it from time to time, but her heart's not in it. She still has a few droplets of the vintage stuff in a spray bottle: I don't think she even sprays it any more (I filched one little spritz so that I would know what it had once been), but just takes a whiff of the sprayer to remind her of better times. What Jolie Madame used to be was a wonderfully severe leather chypre with a floral middle composed mostly of violets: it is the sort of forties thing you imagine being worn by a woman in a skirt suit and a look of determination, and to my nose it is also perfectly wearable, with its heavy dose of oakmoss, by a man. Now of course the oakmoss is gone, and it's just a brightish, vaguely violet floral thing with a bit of leather and patchouli in the base, no real distinction, nothing terrible or shameful but also nothing of any especial interest, certainly no magic. When I went to visit my mom, I took a half-dozen little vials and decants of scents with me, naturally enough: fragrance is basically invisible clothing, and you wouldn't wear the same thing for two weeks, would you? One of them was Fête by Molyneux, a few millilitres of which I had tipped into a sprayer. The day after I arrived, it occurred to me that Fête was the kind of thing she might like, so I suggested she put a little on her skin. Instant love, of course. (I gave her the sprayer.) Fête, like Jolie Madame, is a true, old-school chypre: bright fruity top, deep oakmoss-labdanum base. Everything else is at the whim of the perfumer. My bottle looks like this, only mine is about a third full of gorgeous, gorgeous Fête. 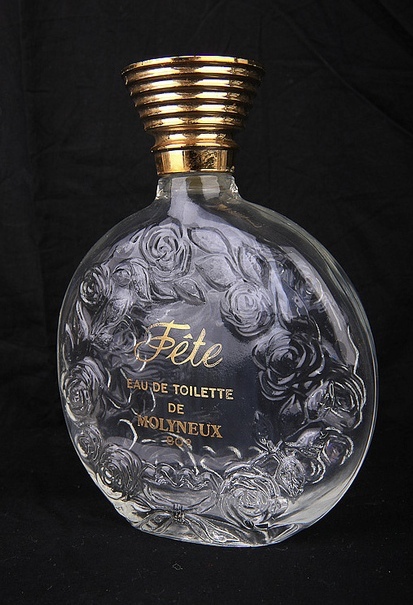 At first whiff, not knowing what Fête is, you would be excused for mistaking it for the likes of Clinique Wrappings or Guerlain Vega or some other brilliant aldehydic floral: piercing (but not fresh-and-clean!) top notes with a slug of fruit, mostly peaches and plums, followed shortly by an abstract bouquet of roses and jasmine. But Fête has other things on its mind, because hard on its heels comes that dark, subterranean quality that only oakmoss has, and the whole scent opens up, enlarges and deepens: suddenly the fruits and flowers have context, as if you can see the whole world of their origin, the earth from which they sprang. It's the olfactory equivalent of a pull-back shot in a movie. It's thrilling. "Fête" means "party" in French — the word is related to "festival" and "feast" — and that seems like a disconnect, because nowadays a party scent would probably be nothing but bright sunshiny fun. But Fête is not a streamers-and-cake birthday party: it's a very grownup soirée with cocktails and a string quartet in the corner.